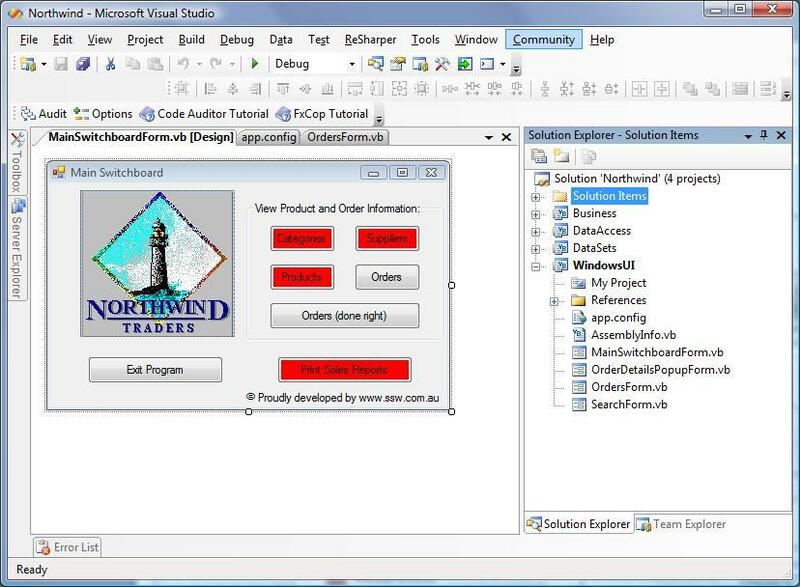 The SSW .NET Toolkit is an example of a distributed multi-layer application based on the Microsoft Northwind database. Designed by Developers for Developers, the real-world source can be used as a model and basis for custom-designed applications perfect for small and medium enterprise (SME) applications. Microsoft's examples like Duwamish and IBuySpy are code intensive and marketed towards architects, not developers. The SSW .NET Toolkit delivers more functionality using less code. Part A demonstrates how to use extended providers for validation, and how to implement searching through records in a database, as well as how to implement SSW Exception Reporter (an extended version of the Configuration Block). Part C implements database deployment from one of our most popular products SSW SQL Deploy. This demonstrates how we deal with the on-going SQL script changes for Client databases. Part D shows no touch deployment. Part E shows better web applications. Part F shows a bad and a good example for a Northwind Windows application. Part H shows a good example for a Northwind Web application (TODO). Part I shows a good example of a Northwind WPF application (TODO). Part J shows a good example of a Northwind Silverlight application (TODO).